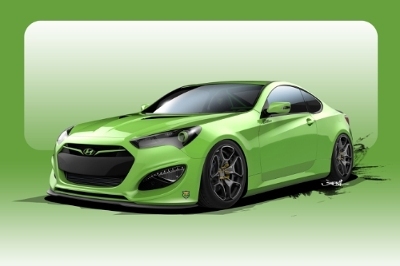 FOUNTAIN VALLEY, Calif., Oct. 26, 2015 /PRNewswire/ -- Rounding out Hyundai's 2015 SEMA lineup, TJIN Edition RoadShow has revealed details on its convention-defying Genesis Coupe. For Neil Tjin's first official Hyundai vehicle built for SEMA, the builder turned to underground racing for inspiration to create this mad, 500 horsepower racer. The vehicle will be revealed at Hyundai's SEMA press conference on November 3 at 11:30 a.m. PT. At the heart of TJIN's Genesis Coupe is Hyundai's 3.8-liter "Lambda" V6 engine, which has been boosted via a Vortech supercharger kit built by the power gurus from Bisimoto Engineering. With the addition of a free-flowing exhaust system, Vortech front mount intercooler and blow-off valve, the vehicle now produces more than 500 horsepower. With the addition of Rotiform 19-in. 3-piece HUR wheels, custom Baer x CBA Extreme Plus brake calipers and Falklen FK345 tires, the vehicle's stopping power is now on par with its go-fast performance. The vehicle now sits lower on KW coilovers to give a more aggressive stance. Unique Fabrication supplied a custom front lip, rear spoiler and custom trunk lid, and the exterior was finished in a custom Kylie Tjin Axalta green paint job. "The Tjin Edition Hyundai Genesis is the perfect mix of speed and style," said Neil Tjin, president, TJIN Edition RoadShow. "The vehicle grabs your attention with its vibrant, Tjin green 'Axalta' paint job and custom Rotiform wheels, boasts impressive performance thanks to a Bisimoto Engineering supercharger system and Baer brake system, and the interior is finished in CT-inspired Alea leather." Follow #HyundaiSEMA to keep up to speed on all of this year's SEMA activity.